R. W. Charles Turner, Jr., M.
W. Ichabod Richmond Jacob, S. W.
W. Samuel Tilden, Jr., J. W.
by the Historical Committee: Charles H. Marble, Chairman; S. Randall Lincoln; Frank Cushing Allen, Secretary. Fifty years ago Old Colony Lodge and its many friends were gathered to celebrate the completion of a century of Lodge life. We shall always cherish the thought as a blessed memory that Divine God permitted our beloved Worshipful Master Charles Hawkes Marble, who presided on that occasion, to survive through the intervening years and to call this communication to order fifty years later. That event makes Masonic history. It also reveals to the world the hold our Fraternity has on those who accept its principles and abide by its teachings. To have survived, successfully, the vicissitudes of a hundred years by a man-made organization was a notable achievement. May we hope that those who come after us and perpetuate the work of Old Colony Lodge will say of these fifty years now under review that the hands into which the destiny of the Lodge was entrusted were loyal, capable, dependable. May I here use the words of our historian of fifty years ago and greet you, Brothers, "in the noble confession of Freedom, Fellowship and Love which is the Eternal Freemasonry." I like to think of our sesquicentennial tonight as a triple celebration, reviving satisfaction that our own Lodge has successfully passed through this extended period of time and emerged strong and healthy. This privilege we share with the Grand Lodge of Massachusetts, united under a single head only a very few months before Old Colony Lodge was granted its charter. having as its Chief Executive, our illustrious Brother George Washington. In 1792 the Grand Lodge as we know it, hitherto two separate bodies, became one body with a single Grand Master. In the same year Old Colony Lodge became an integral part of this united Grand Lodge. Thus these three units — the Nation, the Grand Lodge and Old Colony Lodge — have paralleled their existence, sharing the grave crises of learning how to conduct themselves, to face threatening, financial depressions, wars and' internal dissensions, that threatened the very future of each. History reveals how gloriously these tests were met and how each emerged with a confident self-reliance that inspired faith and loyalty from its members and respect from all. Under the new regime, Old Colony Lodge was the second to receive a charter. Inasmuch as the first had been granted to a Lodge in Maine, then a part of Massachusetts, and since dissolved, we feel we are justified in claiming our Lodge is today the oldest child of the present Grand Lodge. It was in the late fall of 1792 that seven men presented a petition to the Grand Lodge "that they with such others as hereafter may join them, may be created and constituted a regular Lodge of Free and Accepted Masons under the title and designation of Old Colony Lodge within the town of Hanover, Massachusetts." Their prayer was granted and the charter, which still exists, was issued under date of December 10, 1792, and signed by John Cutler, M. W. Grand Master; Josiah Bartlett, R. W. Senior Grand Warden; Mungo Mackay, R. W. Junior Grand Warden, and Thomas Farrington, Grand Secretary. It is a significant fact that not one of the seven petitioners for a charter was from Hingham. Scituate, Pembroke and Marshfield were represented each by two, while the seventh petitioner was from Hanover. The question naturally rises, why was Hanover chosen as the home for the newly chartered Lodge ? Strange as it sounds today, this may be attributed to the fact that in 1792 there was far more business activity, especially in ship building, in Hanover than in any of the neighboring towns. This attracted the workers from these neighboring towns and made Hanover a natural gathering place. It is recorded that as early as 1805 there appeared symptoms of unrest among the members regarding the meeting place of Old Colony Lodge. It developed that a more active response to Masonic teachings existed in Hingham than elsewhere in the district, resulting in an increase in proportionate membership from that town and discontent with the location of the Lodge. First an appeal was made for a charter for a new Lodge in Hingham in 1805 and was denied. Then followed an appeal for removal to Hingham. Denied in 1806, it was finally granted in 1807. The last meeting in Hanover was Nov. 14, 1807, when Jotham Lincoln, Jr. was chosen Worshipful Master, pro tem. Old Colony Lodge met in Hingham for the first time Dec. 11, 1807, exactly one hundred and thirty-five years ago tomorrow. Jotham Lincoln, Jr. was elected Worshipful Master and served twelve years, or until 1819, and again, for a single year, in 1821. The records do not reveal the location of the first hall in Hingham occupied by Old Colony Lodge, but we learn that after a few meetings the Lodge took possession of a hall in a building on North Street near the harbor, owned by Wor. Bro. Jotham Lincoln, Jr., and which it occupied for many years. In the words of the historian of fifty years ago, "From this date there followed a course of unexampled activity and growth extending over a period of almost twenty years." An organization blessed with vitality and healthy growth is entitled to improved lodge-room comforts. January 13, 1860, District Deputy Grand Master Jerome V. C. Smith came to Hingham and dedicated the quarters in the Lincoln Building, with which so many of us here tonight associate pleasant memories. These quarters were occupied by Old Colony Lodge for sixty-nine years, or until we came to this Temple in March, 1929. An organization of this character depends primarily upon the personnel of its membership. A careful review of the records reveals that we have been exceedingly fortunate at all times in the wealth of members of individual strength and character. Although one of the fundamentals upon which Masonry is founded is total abstinence from an indulgence in political discussion within the lodge-room or active participation as a body in partisan politics, it is natural and logical that the teachings of our Fraternity equip our members as useful, competent directors and executives in public as well as private affairs. That this recognition of the real worth of our members has not been restricted within the limit of Old Colony Lodge is best attested by the recognition accorded by the Grand Lodge. During the years of our Lodge existence, ten of our members have been appointed District Deputy Grand Masters, while three were chosen permanent members of the Grand Lodge — Brother E. Waters Burr, our Worshipful Master during the Civil War years of 1864 and 1865 and the following year, 1866, who was elected Junior Grand Warden of the Grand Lodge in 1870; Brother J. Irving Botting, Worshipful Master in 1924-1926 and Treasurer of Old Colony Lodge from 1929 to date, inclusive, who was appointed Representative of the Grand Lodge of Chile near the Grand Lodge of Massachusetts in 1931 and elected Senior Grand Warden of the Grand Lodge of Massachusetts in December, 1933; Brother Winthrop J. Cushing, life member of Old Colony Lodge, Worshipful Master in 1916 and 1917 and an active member and official in many Masonic bodies, who was appointed Deputy Grand Master of the Grand Lodge of Massachusetts in December, 1941. I wish to recall and extend for future consideration a few instances of long personal services rendered that have enriched our Lodge history. April 24, 1905, the Lodge lost a faithful Chaplain who had served for fifteen years and the community an estimable citizen, when Edmund Hersey, II, passed away. Of him it was justly said: "Brother Hersey, a zealous member, the cheerful, willing contributor to the support of our Lodge, the helper of deserving men and women, honest and faithful town and private official, a good father, a genial gentleman, a true Mason," a eulogy richly deserved. October 14, 1924, Right Worshipful District Deputy Grand Master Edward C. Holmes presented to the Treasurer of Old Colony Lodge, David Cobb, a Veteran's Medal, he having completed fifty years of membership in our Fraternity. Brother Holmes then called attention to the fact that Brother Cobb had served as Treasurer thirty-three years. February 12, 1929, at the last meeting Old Colony Lodge held in the Lincoln Building, Worshipful Master Herbert W. Wilder announced the death of Brother Cobb, a member of our Lodge fifty-five years and its Treasurer thirty-seven years. Our Lodge records reveal one more series of events, covering a period of eighty years, that discloses an unbroken influence on three generations of a family. January 7, 1902, it was the privilege of Worshipful Brother Edwin Wilder, who had been Master of Old Colony Lodge in 1861 to 1863, to install his son Edwin M. Wilder as Master of Old Colony Lodge. March 9, 1920, Worshipful Master Edwin M. Wilder raised his son Herbert W. Wilder, our present distinguished and capable District Deputy Grand Master of the 27th Masonic District. On November 13, 1928, Worshipful Brother Edwin M. Wilder installed his son Herbert as Worshipful Master of Old Colony Lodge—the third generation of that family to be so installed in sixty-five years. December 10, 1929, Worshipful Brother Edwin M. Wilder assisted in presenting a Past Master's jewel to his son, Worshipful Master Herbert W. Wilder, who in turn, February 13, 1940, pinned a Veteran's Medal on the breast of his father. This year the Grand Master of the Grand Lodge of Massachusetts, Most Worshipful Albert A. Schaefer, revealed the appreciation of the Fraternity for the loyalty and service of our Brother by appointing Worshipful Herbert W. Wilder as District Deputy Grand Master of the 27th Masonic District. January 13, 1942, Right Worshipful District Deputy Wilder made his first official appearance in Old Colony Lodge, receiving a sincere and hearty welcome from his Brother members. Thus is written the closing chapter of this remarkable family history during the fifty years under review. Our records reveal unflagging zeal, unswerving loyalty and intelligent leadership during this entire period. I am sure honor has been bestowed where honor was due. November 11, 1941, an unusual, if not unique, bit of Masonic history was made. It was the public installation of Worshipful Master Harold L. Downing. The Past Master's jewel had been presented by Right Worshipful Brother Charles Hawkes Marble, when Worshipful Master Downing presented the gavel to Right Worshipful Brother Marble and escorted him to the Master's station. 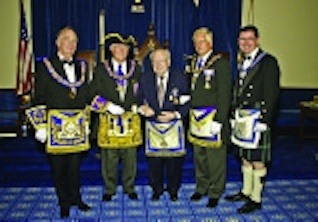 Just fifty years before, Brother Marble had himself been installed Master of Old Colony Lodge. Having recalled the wealth of membership value, let us give recognition to the outstanding material accomplishment of this period. September 11, 1917, there was read to the Lodge those paragraphs of the will of Worshipful Brother Wallace Corthell, of vital interest to our members, as follows: "All the rest and residue remaining after the death of my wife, and after the payments herein immediately before set forth, I hereby devise and bequeath to the said Old Colony Lodge, A.F.&A.M. to be held by such Lodge as a fund at interest to accumulate until it shall be deemed sufficiently large to erect a building to be used for meetings and Masonic purposes of said Lodge." April 9, 1918, the residue of this estate was presented to the Lodge as a final settlement of the thoughtful generosity of our Past Worshipful Master. Through judicious handling of the fund and radical changes in land values in downtown Hingham, it became possible, in March 1928, to so increase the available fund as to make the building of a Temple an actual fact. Too much praise cannot be given the committee to whom had been entrusted the handling of these funds. As I have recorded these events, I like to think of our Temple as not alone a memorial to the generosity of Worshipful Brother Corthell, but also as mute testimony to the efficiency and the unselfish faithfulness of the committee. October 17, 1928, the corner stone of this Temple was laid under the leadership of Right Worshipful Otis C. White, acting for the Grand Master, assisted by Right Worshipful Stetson Foster, Right Worshipful J. Irving Botting, Worshipful Winthrop J. Cushing and Worshipful Master Seth Sprague. March 5, 1929, our Lodge met for the purpose of dedicating our new Temple. The Grand Master of the Grand Lodge, Most Worshipful Herbert W. Dean, his suite and 154 members and Brothers from neighboring Lodges were present. It is interesting to note that during the welcoming address of Worshipful Master Herbert W. Wilder he presented to Grand Master Herbert W. Dean our oldest member, Brother Seth Sprague, ninety-two years old and for sixty-two years a member of Old Colony Lodge. The Temple was solemnly dedicated to the purposes of Freemasonry and it is to the hospitality of our Lodge under this consecrated roof that our Lodge bids you welcome tonight. We are gathered to celebrate the sesquicentennial of Old Colony Lodge. An organization, man inspired and man conducted, that has kept itself true to the standards established at its birth for a century and a half is entitled to the respect of all in the community of which it is a part. These annals of the past fifty years, supplementing as they do the splendid history of the first hundred years, reveals the life story in outline of Old Colony Lodge. Your committee hopes in time to complete and submit to our members a more detailed account of the events of the past fifty years. Calling the roll of past officers and members, one cannot help having a real satisfaction of the maintenance at a high level of our membership. Almost without exception, judged by the test of time, they have been men of character, integrity and ability. Their acceptance of and response to the teachings of our Fraternity have made them good citizens and good family men. Hitherto we have clung tenaciously to the traditions of Freemasonry and recounted only events strictly within the Brotherhood. We are living today in a different world from the one of a few years ago. We have seen arise in Europe a devastating power which, through mass murder and unbridled cruelties, has terrorized and reduced to abject submission nearly all of that continent. Our Fraternity has been an object of especial persecution. Grand Lodges in several of the nations have been obliterated. Individual Lodges have been raided, their furnishings stolen or destroyed, and members warned that further Masonic activities would be regarded as criminal acts and treated as such. Organized Masonry does not exist in Europe outside of Great Britain and Sweden. This must not happen here. I believe I am right in stating that Masonic history was recently made when a Grand Master of one of the Grand Lodges in these United States made a nation-wide appeal over the air to every listening Brother for a universal, fraternal support of our men in uniform, in training camps and battlefields throughout the world. He emphasized the need of such support being all inclusive. At the time he spoke, he told the world his most encouraging response had come from our own Grand Lodge in Massachusetts. Let us retain all our loyalty to our Fraternity and its teachings, but let us not close our eyes to the obligations we owe future generations. The past has been splendid. Let not inaction or self-satisfaction on our part dim by the slightest degree the equally splendid achievements that are possible in the future. May our Fraternity impress upon all mankind our determination to make the world better and brighter for others by our being in it. As we end this record of fifty years of achievement on the part of Old Colony Lodge, may we leave a parting message for consideration of all future Brothers? When they take upon themselves the solemn obligations of our Fraternity at the altar of Freemasonry, may they as individuals and as a brotherhood, accept and abide by the teachings of God, preserve their love of home and constantly reaffirm their loyalty and devotion to our Flag and the Country for which it stands. R. W. Fearing Loring, M.
Bro. Charles Fearing, S. W.
Bro. Charles Gill, J. W.
Bro. Benjamin Studley, S. D.
Bro. John Lane, J. D.
Bro. Hezekiah Lincoln, S. S.
Bro. Rufus W. Lincoln, J. S.
'"He congratulated the officers and members, and the Fraternity, on the installment of the Lodge. He congratulated the audience and the community, because he said the institution was calculated to promote the sociai and moral welfare of any community where the sound of the gavel was heard. The Lodge was chartered in 1797, and continued in successful operation until about twenty years since, when its labors were suspended. That true and trusty Brethren, who loved the institution, had united to revive the Lodge - men of intelligence and moral worth, enjoying the confidence of the -hole community, and of the Grand Lodge - men of whom not an individual would presume to say that in their associate capacity, they had any evil designs against either Church or State. "He then referred to the life and services of Washington, and while others in the cities and towns of the Union were discoursing upon his exalted patriotism, his wise policy as a statesman, and the rich inheritance he has left in the imperishable wisdom of his fatherly counsels, he, the speaker, dwelt at considerable length upon his Masonic character, his labors in the Lodge, devotion to the Craft, Masonic correspondence, &c. &c.
After refuting many of the objection that have been raised against the institution, and stating its beneficial influence, he said that it now enjoyed a higher degree of prosperity in every State of the Union, than it had at any period in the history of our country. He exhorted the brethren to a faithful discharge of every Masonic duty, and gave them the parental benediction of the Most Worshipful Grand Lodge. At the close of the address, the choir sang "Auld Lang Syne", and the exercises were closed with an impressive prayer, by the venerable Rev. Br. Richardson." Edwin Wilder, 2d, W. M.
Luther Stevenson, Jr., S. W.
Alfred L. Rouell, J. W.
E. Waters Burr, S. D.
A. B. Bates, S. S.
Officers of Old Colony Lodge, Hingham. E. Waters Burr, W. M.
Wm. Fearing, 2d, S. W.
Jason W. Whitney, J. W.
Charles N. Marsh, S. D.
Henry Merrill, Jr., S. S.
Eliphalet L. Cushing, J. S.
Treasurer, Br. David Cushing, Jr.
Chorister, Br. Luther Stephenson, Jr.
Tyler, Br. Henry F. Hersey. The members of Old Colony Lodge, A. F. & A. M., Hingham, Mass., witnessed a public installation of their newly elected officers Jan. 8, and enjoyed a banquet afterwards. There was a large attendance of members witb their families and the occasion was one of much interest. Tlie names of the officers installed are as follows: Walter W. Hersey WM, Harry L. Thomas SW, Edward W. Thayer JW, David Cobb, Jr. Treas, William H Thomas Sec, Arthur W. Burr SD, Oliver Cushing JD, Atkins S. Rich SS, Alexander W. Rich JS, Louis C. Cornish Chaplain, William J. Nelson IS, Arthur L. Whiton Tyler, Charles D. Hart Organist. The installation ceremonies were conducted by Wor. Bro. Frederic L. Putnam, Grand Lecturer, assisted by Wor. Bro. Charles M. Shute, past master of Mt. Vernon Lodge, as Marshal. Old Colony Lodge of Hingham celebrated its 200th Anniversary on December 10, 1992. M .W. Edgar W. Darling, Grand Master, was present for the celebration. Wor. Frederick M. Shaw, Jr., Master, presented M. W. Bro. Darling with an artist's rendition of the "M. W. Edgar W. Darling Bridge" to be built at the Charlton Railroad at the Masonic Home. The Grand Master was also presented with a scaled replica of the sign that will be posted before the bridge. R. W. E. Gardner Jones; R. W. William R. Wirkala; M. W. Edgar W. Darling, Grand Master; Wor. Frederick M. Shaw, Jr., Master; R. W. Richard G. Weston, D. D. G. M. Plymouth 27th District; and Wor. John W. Hanson, Grand Marshal. Past Masters of Old Colony Lodge: Front row, Wor. Walter S. Bird; R. W. William R. Wirkala; R. W. E. Gardner Jones; R. W. Richard G. Weston D. D. G. M. Plymouth 27th District; Wor. Frederick M. Shaw, Jr., Master; Wor. Carleton N. Goff; Wor. Elbert S. Stallard; and Wor. David J. Adam. Second row: Wor. Edward G. Jones; Wor. Thomas L. Knowlton, Wor. Thomas H. McCallum, Jr.; Wor. David J. Damstra; Wor. F. Brian Emery; Wor. Lawrence E. Emery; Wor. Gerald J. Sullivan; and Wor. Paul E. Wuori, Sr.
Back row: Wor. James D. Damstra; Wor. Ronald E. Lincoln; Wor. George A. Parker, III; and Wor. Brian S. Noble. R. W. John Maynard, M. W. Richard J. Stewart, Wor. Carlton Goff, R. W. Joseph DeNicola, and Wor. Ian Mackenzie. The Grand Master visited Old Colony Lodge in Hingham for the rededication of the building and the installation of officers. He also presented the Joseph Warren Medal to Rt. Wor. Joseph DeNicola. Rt. Wor. Dr. John Maynard, past D. G. M. of the United Grand Lodge of Victoria, Australia, and their Masonic Ambassador to Massachusetts, traveled from Australia to join in the celebration. Rt. Wor. Bro. Maynard and Old Colony’s newly installed master, Wor. Ian Mackenzie, were both raised at Scotch Collegians Lodge #396 in Melbourne, Australia. This page was last modified on 4 September 2018, at 12:55.